***Pre-entry has now closed*** We do have a few spaces available, so will take on the day entry (t-shirts not available to on the day entries). The 7 Hills follows a way marked course designed to test a riders strength, endurance and determination. GP Sport and Wight Mountain have teamed up again in 2019 to ensure this legendary event stays on the calendar. 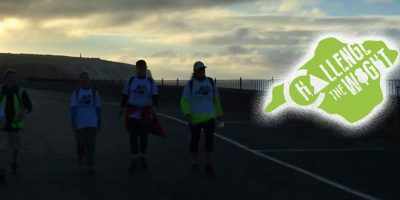 The course will take in some of the Island toughest off road climbs and will cover roughly 26 miles from Freshwater Bay to Sandown Airport. The fully licensed Island Bistro at Sandown Airport will be open and offering a comprehensive menu at the finish – it’s the perfect place for friends and family to await your arrival. Make sure you bring a few pounds with you – you will have earned your lunch! Free parking is available at Sandown Airport. The entry price includes a 2019 edition technical t-shirt. 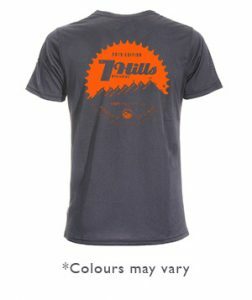 T-shirts are available in mens (XS to XL) and womens (8 – 16) fit, in grey with a contrasting orange print. Great event, great course, great people and great coffee what more could you want. Great evening. Good fun brilliant atmosphere. First time running a full 5k. And what an awesome way to do it. Roll on next year. It was my first ever 100 mile Sportive and loved it, even though it was very tough! The course was well signposted and the feed stations were well spaced out with great local food. Would like to thank everybody which made the day happen as it was a great day. Looking forward to next year! Great new route, clearly marked and very well organised! Hard, hilly and wet if you embrace the lake! See you next year! Well done all! Epic course. Great turn out. Big thank to organisers . More races like that please!! !